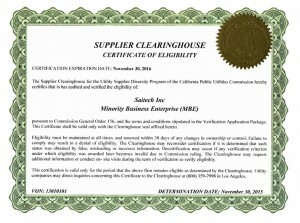 Supplier Clearinghouse / CPUC - Saitech Inc.
Saitech is an approved MBE (Minority Business Enterprise) supplier certified by the Supplier Clearinghouse.The Supplier Clearinghouse is a Commission-supervised entity whose primary purpose is to audit and verify the status of woman and minority owned businesses, and to establish and maintain a database of woman, minority, and service disabled veteran owned businesses that is accessible to the California Public Utilities Commission and to participating utilities. Certification of eligible suppliers was designed to encourage, recruit, and utilize WMBEs by participating utilities. 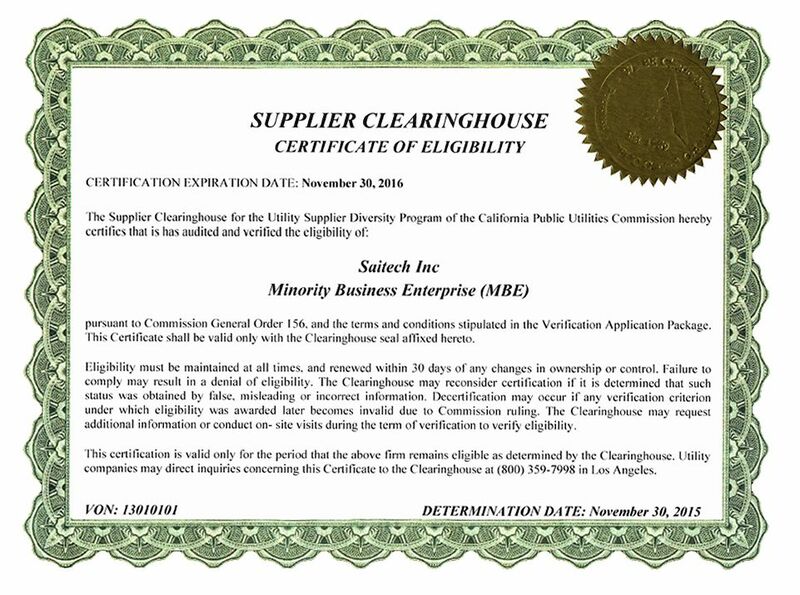 By being certified, Saitech Inc. was able to demonstrate with clear and convincing evidence that the minority and/or women unconditionally own 51% of the applicant concern and are responsible for the day-to-day as well as major decisions on matters of management, policy, and operations. Pacific Power and Light Company, Inc.